(Note: A combination of company records, industry folklore, and excerpts from “Low & Slow – An Insider’s History of Agricultural Aviation” by Mabry I. Anderson ©1986 and published by AgAir Update, make up this synopsis of our company history). 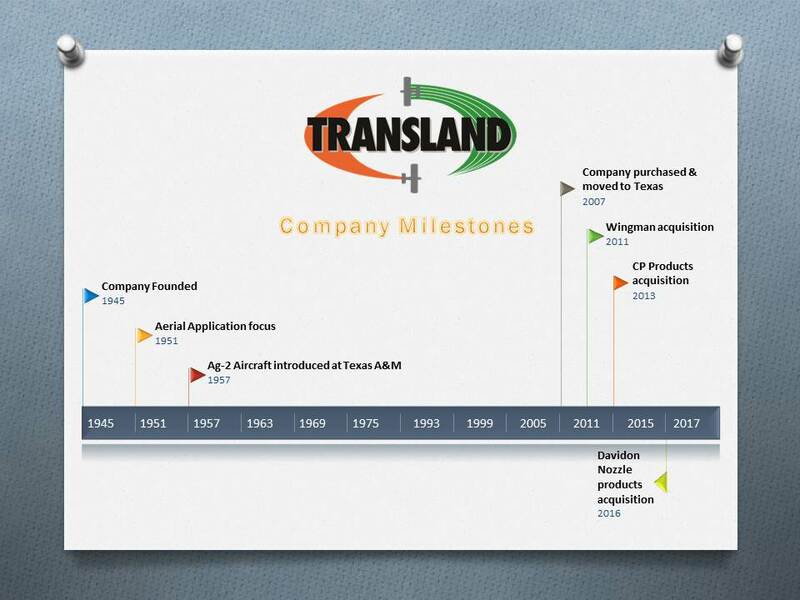 Since 1945, Transland has been a business focused on serving aviation customers through the design and manufacturing of quality products. The customers in the early days were military aircraft firms. In 1951, under the leadership of George S. Wing, Transland started focusing on products for the aerial application business, with many becoming standard in the industry. Transland was even instrumental in building the Ag-2 model aircraft, an airplane designed specifically for the dispersal of dry and liquid applications. The Ag-2 also brought about the first use of Transland products in fighting major fires, as it the plane was credited with being a big help in fighting a large brush fire near Malibu, CA. According to Low & Slow, “the Ag-2 made its first agricultural appearance when it was demonstrated at the Texas Agricultural Aviation Operators’ annual meeting at College Station, Texas in January 1957.” Conrad Barlow joined the company during this time and went on to become the owner of Transland until his death in the early 2000’s. In 2007, Transland was purchased by James B. Frank and relocated to his hometown of Wichita Falls, TX. Only three employees made the move from California to Texas, but 10 years later all three are still active in the operation of the company. One of those employees, Roberto Rodriguez, was named General Manager when the move took place and he was promoted to president in 2015. 2011 – acquired the Wingman product line. Wingman, actuates the hopper door and equalizes the load, all from the cockpit, saving operators time and money. 2013 – acquired CP Products, the leader in spray nozzles and tips for both aerial and ground spraying. The company has a great history which can be read here. Click here to see the complete line of CP Products. 2016 – acquired the Davidon product line including the Hi-Tek Rotary Nozzle, Tri-Set Nozzles, Aluminum Booms, J-Tubes and more. Transland is committed to Dispersing Quality products for the Aerial Application business throughout the world. Look for more announcements of development projects in the near future as we continue to grow!